A roaring lion, reared up on his hind legs, an arrow through his brow, faces his opponent: a king who holds him at arm's length with one bare hand and plunges a short sword through his stomach with the other. This king, muscles visible in his forearm, embodies might, the victor even in a one-on-one battle with a ferocious king of beasts. On its own, this powerful scene would stop many museum-goers in their tracks. Yet it is just one image in a roomful of them, artfully carved into alabaster panels that are collectively known as the lion hunt reliefs. Housed since 1856 at the British Museum, they date to seventh-century B.C. Assyria and rank among the finest relics of ancient civilization. The panels were discovered in 1853 by Hormuzd Rassam, an Assyrian supervising a dig for the British in territory controlled by the Ottomans. Rassam and his team first found a slab in a mound at what once was Nineveh, across the Tigris River from Mosul, Iraq (which, sadly, is one of many archaeological sites that Islamic State has deliberately destroyed or heavily damaged in recent months). Digging further, they uncovered a palace that had been buried for more than 2,000 years. It had been built by King Ashurbanipal, who ruled Assyria from 668 to 627 B.C., the height of an empire that at times included much of the present-day Near East. Ashurbanipal made war, expanding his domain, and he was something of a scholar, learning to read and assembling a famous library of cuneiform tablets (much of it also at the British Museum). He was a builder, too—erecting, enlarging and embellishing temples, town defenses and residences. 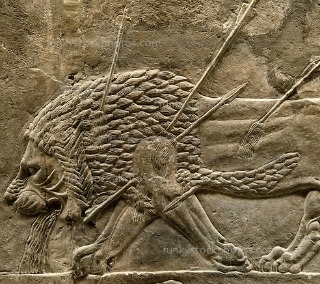 When Ashurbanipal extended the royal quarters at Nineveh with a vast new North Palace, he lined some of its passages with bas-reliefs, including the lion hunt. 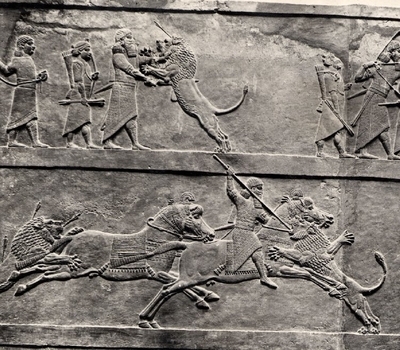 Lion hunting was a royal pastime in ancient Assyria, and Ashurbanipal commissioned these reliefs to demonstrate his prowess at this sport of kings. Once colored but now faded to neutral, they resemble a modern-day storyboard or, as some commentators have noted, unfold like an ancient comic book. Ashurbanipal appears in them again and again as vanquisher, thus reassuring his people. With such unsurpassed power, who could question his ability to defend and protect his kingdom? Visitors to the lion hunt gallery in the British Museum enter Ashurbanipal's world: The panels, plus some fragments, hang along the sides of a long, narrow, dramatically lighted gallery. Viewers experience the epic drama enveloping them almost as if they were in a cyclorama. There is Ashurbanipal, always taller than his attendants, racing around in a chariot, spraying his arrows at one lion after another. There is the king, in full regalia—including a tall, cylindrical hat—on horseback, drawing back on his bow and arrow, a lion in his sightline. There he stands with four dying lions at his feet. His wounded prey is everywhere. Some lions writhe in agony; blood gushes from their wounds. A crippled lioness lies on her back, fighting death. A lion turns his head away as a spear-bearer thrusts his weapon through the animal's neck. Another—not stopped by four arrows—rushes the king's chariot in counterattack, only to confront two spear-bearers ready to plunge their weapons into his throat. In another scene, a similarly situated lion meets a sword wielded by the king as well as two spears. Finally, the king's attendants carry four dead lions off the field on their shoulders. It is not long before it becomes clear to viewers that this is not a lion hunt, per se, at all. These reliefs depict a brutal massacre—if a strikingly beautiful massacre—not a heroic drama. The lions have been released from cages, indicating that they have been captured in advance or possibly, historians have written, even raised in captivity. The action takes place in an arena. In the distance, the king's subjects watch from a hill. They are attending an event, a pageant of propaganda for the king. Rather than waging a fair fight between man and beast, Ashurbanipal struts on a stage, like an Englishman riding to hounds. Viewers feel pathos for the animals, not admiration for the king. The artist—experts believe that one master designed these panels, which many artisans then carved—provides clues to that conclusion in his renderings. The king and his men stand rigidly, stone-faced, as they kill. The lions, on the other hand, are realistic, lifelike. You can see their rage, almost feel their pain. At the start, Ashurbanipal's horses are clearly nervous, kept behind a screen to prevent their sight of the lions. But never do the cold-blooded humans who control this event seem to show emotion. At the same time, these reliefs are justly renowned for their incredible and vivid details. The king's clothes are embroidered with tiny rosettes and fancy borders. His bracelets bear a lion's head, as does the end of his bow. Beards and hair are curled or combed in place. The lions show their muscles, their wet snouts and whiskers. The horses, with groomed manes, wear bridles decorated with medallions. There is movement, tension and grandeur in these panels, artistry that surpasses anything else that preceded it. And, some would say, even much ancient art that followed it—such as classical Greek art. 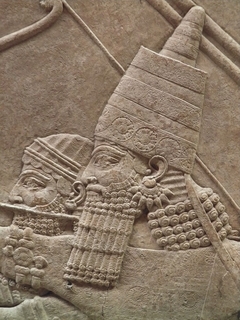 In a 1976 book titled "Sculptures From the North Palace of Ashurbanipal at Nineveh, 668-627 B.C.," R.D. Barnett, a keeper at the British Museum, wrote: "There is nothing in Greek art, with its careful restraint of movement, and idealizing of emotion and its anthropocentric world, to compare with this astounding portraiture of the extremes of animal behaviour, of limitless bravery, ferocity, anguish, terror and death. "Nor indeed does there seem to be in any other art," he added.